Shout! Factory has teamed up with Hasbro Studios and the Hub network once again another compilation of episodes from Hub’s Pound Puppies. Pound Puppies: Holiday Hijinks is one of the best compilations from this family and kid favorite series to be released yet. That is largely because of each episode’s writing. This compilation offers viewers some of the series’ most heartfelt episodes to date. Just as noteworthy in this compilation is the guest voice talent. Both parents and kids alike will recognize the celebrity voices that are included in some of the episodes in this set. Something more subtle, but just as worth noting in this collection of episodes is that each one features its own musical number. It’s something that hadn’t been seen (or rather heard) in previous collections. It’s a nice touch to the episodes in question. The reason for that will be discussed later. All things considered, Holiday Hijinks is one more great addition to any family’s home DVD library, whether it’s their first introduction to the new Pound Puppies or not. The latest compilation of Pound Puppies episodes includes five more episodes from the Hub network’s hit children’s series. This follows the same format as the previous DVD compilations that have been released. The episodes collected for this collection stand out because they are some of the series’ most heartwarming episodes yet. The collection’s opener, “I Heard The Barks on Christmas Eve” is the collection’s only actual holiday themed episode. It’s still a wonderful story, nonetheless. For the first time ever, viewers see that Mr. McLeish actually has a heart and isn’t the mean middle aged man that he comes across as being in most episodes. It presents those classic messages that everybody needs somebody and that everybody deserves somebody, especially during the holidays. Audiences will appreciate how writer Joe Ansolabehere expanded on the show’s central theme of family in the set’s second episode, “I Never Barked For My Father.” Lucky meets his long lost father and brother for the first time ever in this episode. These are two of the collection’s finest. What’s more, older audiences will appreciate the guest vocal talent shared here. That is another positive to this set of episodes. The episodes collected for Pound Puppies: Holiday Hijinks offer plenty of heart and laughs. The writers behind the show are to be applauded for their work. Just as worth noting of these episodes is the guest vocal talent recruited for these episodes. Lucky’s father is voiced by none other than Gary Cole in “I Never Barked For My Father.” And his long lost brother is voiced by one Gary Cooksey. Cooksey is best known for his time on Diff’rent Strokes as well as voicing Montana Max on Tiny Toon Adventures and portraying Robert “Buddy” Budnick on Nickelodeon’s hit 90s series, Salute Your Shorts. Older audiences will recognize Gary Cole from his roles in Office Space, Dodgeball, Talladega Nights, and Harvey Birdman: Attorney at Law just to name some of his work. Cole and Cooksey are just a couple of the well-known names that grace this collection of episodes. Fred Stoller (Wordgirl, Everybody Loves Raymond) guests on the collection’s opener as the voice of Ralph. Ralph is a stray that has lost his Christmas spirit because he has never had a single owner. That all changes thanks to the Pound Puppies. Wayne Knight (Seinfeld, Scooby-Doo & The Goblin King, Jurassic Park, The Exes) also shares his talents as the voice of Ralphie, Mr. McLeish’s old friend in “Good Dog, McLeish.” If that isn’t enough, then the addition of both Tress MacNeille (Futurama, The Simpsons) and Charles Shaughnessy (The Nanny) as guest talent in “Prince and the Pupper” will certainly convince parents to check out this latest collection of Pound Puppies episodes with their kids. The list of guest talent included in Pound Puppies: Holiday Hijinks is only a glimpse of the big name actors and actresses that have lent their talents to this series over the course of three seasons. And it’s just one more reason for families to enjoy this collection together. There is one more reason that families will enjoy the episodes presented in this set. That reason is that each of the set’s five episodes includes its own musical number. It would have been so easy for the writers to go over the top considering the history of musical numbers in shows that aren’t known for musical numbers. Instead, the show’s writers made each episode’s musical number respectable and within limitations. They didn’t make them big, cheesy tongue-in-cheek numbers. They actually add a certain amount of emotion and comic relief where necessary. Just as with the guest vocal talent and the equally enjoyable writing overall, the musical number become one more part of the whole that makes Pound Puppies: Holiday Hijinks well worth the watch any time of the year. It is available now on DVD in stores and online. It can be ordered direct from the Shout! Factory store at http://www.shoutfactory.com/product/pound-puppies-holiday-hijinks. 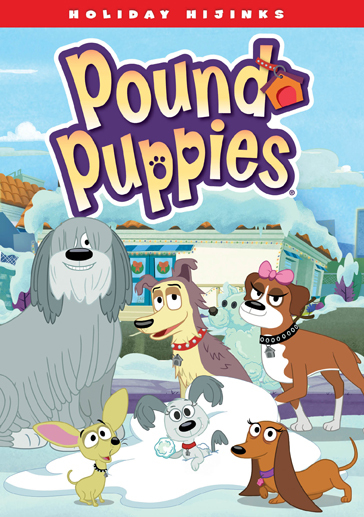 More information on this and other Pound Puppies DVDs is available online at http://www.shoutfactory.com and http://www.facebook.com/shoutactoryofficial. To keep up with the latest sports and entertainment reviews and news, go online to http://www.facebook.com/philspicks and “Like” it. Fans can always keep up with the latest sports and entertainment reviews and news in the Phil’s Picks blog at https://philspicks.wordpress.com. The long wait is finally over, Toonsters. Nearly four years have passed since audiences were offered their last dose of Tiny Toon Adventures episodes. This past Tuesday, Warner Home Video released the long awaited third volume of shorts in its own two-disc set loaded with enough laughs, puns, sight gags, and pop culture references to make any classic cartoon fan happy. Would it have been nice to have a full thirty to thirty-five episode collection as with the previous pair of collections? Yes. But something’s better than nothing, considering how long audiences have waited. And this new set is something. It boasts some of the show’s best episodes. The episodes are just one part of what makes this collection so enjoyable. The original hand-drawn animation will bring back that sense of nostalgia for lovers of classic cartoons, too. And the use of some of the top voice talent in the industry then and now make for even more enjoyment. Altogether, it makes for one more must have for any original Tiny Toon fan and even for any of today’s younger viewers. Tiny Toon Adventures Vol. 3: Crazy Crew Rescues boasts some of the best episodes from this modern classic cartoon. The show’s original audiences will love seeing classic episodes such as “Kon-Ducki” (which pays a little tribute to The Wizard of Oz and even The Bee Gees), “The Potty Years”, and its own take on the film noir classic, Sunset Boulevard in the episode, “Sepulveda Boulevard.” There is also a fun episode titled, “Toon Physics” which explains the differences between real physical science and that of cartoons. It isn’t the first cartoon to ever poke fun at the incredibility of cartoon physics. But it’s still just as funny as others of its sort. This episode features revered voice talent Maurice LaMarche (Futurama, The Simpsons, Animaniacs, Pinky & The Brain) as a spoof of legendary actor Orson Welles. Instead of Welles, his character here is a whale named—you guessed it—Orson Whales (ba-dump-bump-bump). This set also includes the “controversial” episode, “One Beer” in which Buster, Plucky, and Hampton show young audiences the dangers of drinking and driving. Along those same lines, there is even an episode that teaches the importance of childhood literacy in “Why Dizzy Can’t Read.” These are all just a handful of examples of what Tiny Toon Adventures Vol. 3: Crazy Crew Rescues has to offer both its original fans and their own kids. Everybody will undoubtedly have their own favorites from this set. And even with just two discs, this set boasts more than its share of great shorts. The episodes alone make for loads of enjoyment for both the show’s now grown-up audience and for their own children. Adding to the enjoyment of this set is the continued original hand drawn animation. So much children’s programming today is not true animation. It is in large part CG-based programming. So unearthing this collection provides yet another reminder for older audiences of what real animation looks like. And it serves as an example for today’s younger audiences the importance of maintaining the classic art of actually drawing animation, rather than relying on technology for everything. The only downside to the animation here is that it isn’t as clear as with the show’s previous releases. It looks like the quality of the transfers with this set weren’t as solid as with the previous releases. But it’s not that bad. So while it does leave at least a little bit to be desired, it’s still nice to have this relic of a bygone era given new life. The show’s original animation and its equally entertaining episodes make for so much enjoyment for audiences of all ages. The cherry on top for not just this set but also the show as a whole is the inclusion of some of the top voice actors in the industry. As already noted, veteran voice actor Maurice LaMarche is among the show’s ranks of well known actors. Also in the cast are the likes of: Frank Welker (The Real Ghostbusters, Scooby Doo, etc. ), Charlie Adler (Aaahh!!! Real Monsters, The Superhero Squad Show, etc. ), Tress MacNeille (The Simpsons, Futurama), Cree Summer (The Cosby Show, A Different World, Codename: Kids Next Door) and Don Messick (Garfield & Friends, A Pup Named Scooby Doo, The Flintstones, etc.). The chemistry between the cast was obvious throughout this new set of episodes, just as with the previous releases. Whether for the general comedic timing or the interactions with each other, the voice cast of Tiny Toon Adventures was the perfect choice. It was their interpretations of their characters that put the final touch on what was and still is today one of the best cartoons of the twentieth century. Tiny Toon Adventures Vol. 3: Crazy Crew Rescues is available in stores and online now. 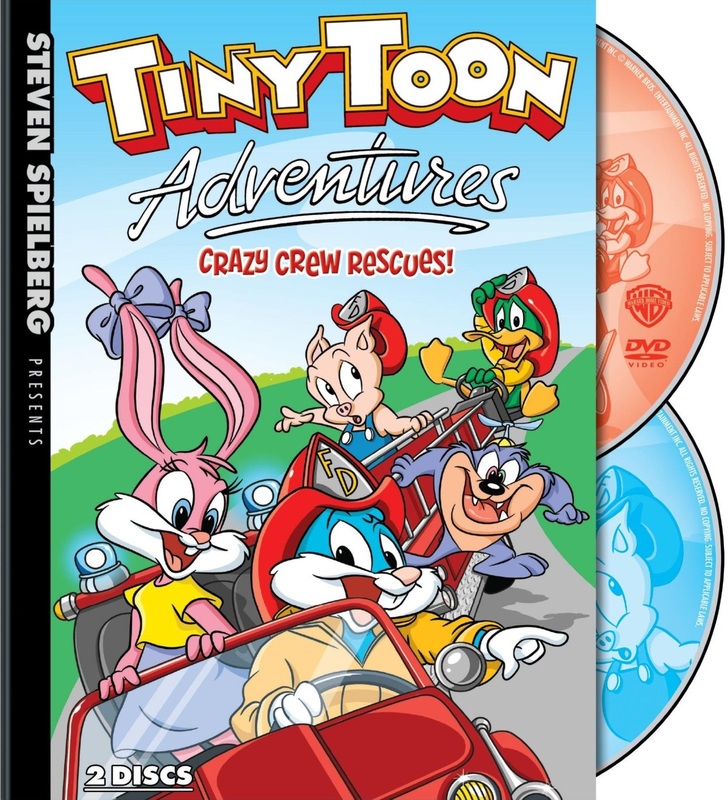 It can be ordered online via the Warner Brothers store at http://www.wbshop.com/product/steven+spielberg+presents+tiny+toon+adventures+volume+3+1000311856.do?sortby=ourPicks&from=Search.